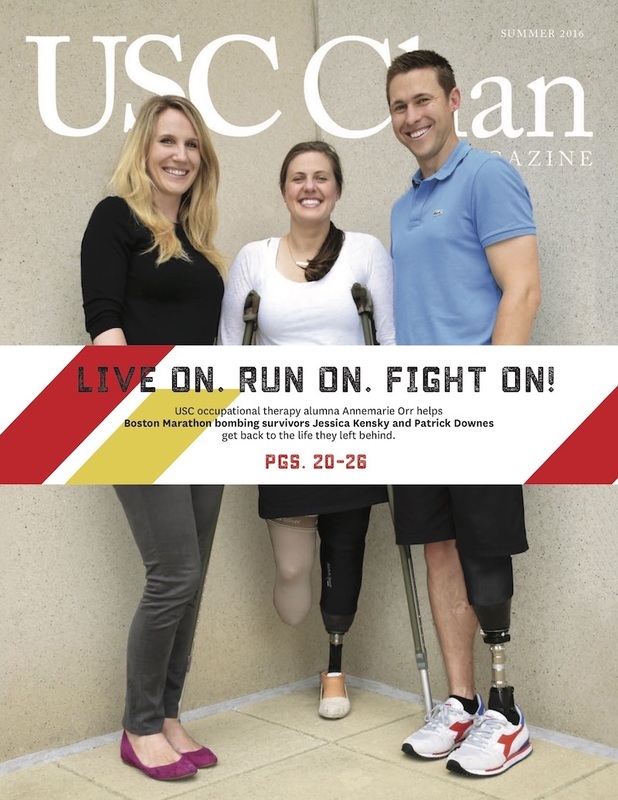 USC Chan alumna Annemarie Orr ’07, MA ’08, OTD ’15 uses the power of occupational therapy to help Boston Marathon bombing survivors Jessica Kensky and Patrick Downes get back to the life they knew. How do you decide to amputate your leg? That was the impossible question Jessica Kensky faced two years ago at Christmas. 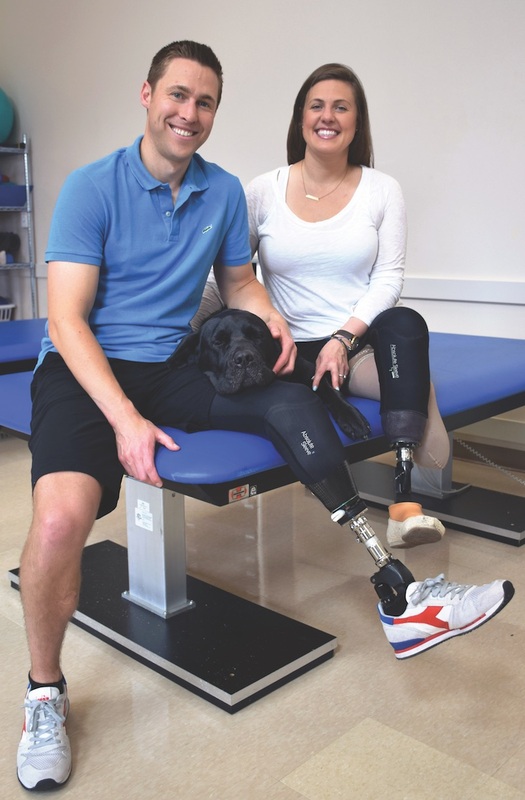 Kensky and Patrick Downes, her husband of six months, both lost their left legs below the knee in the Boston Marathon bombing. The blast, one of two successive detonations at the race’s finish line, also tore off the heel pad and Achilles tendon on Kensky’s right leg. For about a year following the 2013 terror attack, Kensky saw countless doctors and underwent several surgeries to repair her right limb. In 2014, Kensky and Downes gained special status to become patients at Walter Reed National Military Medical Center, a rare designation that requires Secretary of Defense approval. Unlike the civilian world, the facility features state-of-the-art technology and specialists who treat military blast amputees in one centralized location and fosters the kind of camaraderie that only comes from sharing a space with individuals recovering from similar injuries. Following several surgeries at Walter Reed Bethesda during which a medical team led by orthopaedic surgeons attempted to salvage her leg, Kensky still suffered from debilitating pain. The binder was meant to help Kensky track her daily activity — how long it took to accomplish tasks, her pain level and her perception of her own functioning. “It was a good way for her to very plainly and clearly see what her life was like and whether or not she needed to amputate and move forward with that decision,” Orr says. Kensky scheduled her surgery at Walter Reed Bethesda for January 2015. Her first amputation happened without warning or consent. But now Kensky found herself in another unimaginable situation: How do you say goodbye to your right leg? “Jess came in [the day before her surgery] and said, ‘What do I do? Do I have people sign it?’ We went through all these different things that didn’t seem right,” Orr says. Orr remembered a patient with a double amputation she once treated whose grandmother had porcelain plates of his footprints as a child hanging on her wall. “For him it was difficult but really neat to go back to his grandmother’s house and see that she still had his footprints because that was all he had left of both of his feet,” she says. Orr designed a therapeutic activity in which Downes and Kensky — along with their service dog, Rescue — painted their right feet in blue and yellow, colors that have come to signify solidarity in the bombing aftermath, and stamped their footprints on a page. Following her surgery, Kensky continued her occupational therapy with Orr, this time with bilateral below-knee amputations. At Walter Reed Bethesda, Orr and two other staff occupational therapists in the medical center’s amputation service cover everything from basic self-care, like dressing and bathing, to returning to community activities and reintegration. While Orr had worked with many service members and their families at Walter Reed Bethesda, Kensky and Downes posed a unique challenge. “Jess’ goals are different than a lot of the service members,” Orr says. Though he was by Kensky’s side throughout her rehab journey, Downes was further along in his own recovery process. Orr and Kensky instantly had a connection that went beyond the clinic: both are runners in their early 30s, health care providers and California natives. “If I’d met her any other way, we would’ve gravitated toward each other,” Kensky says. Orr also saw reflections of herself in Kensky. “You can’t help but see what she would want her goals to be and how similar they are to what mine would be,” Orr says. Those goals can fluctuate during the many months of rehabilitation. After her second amputation, Kensky refused to shop. But, more than keeping up with the latest fashion, Kensky was learning to feel like herself again. Along with Downes, the pair game-planned for Kensky to attend a rustic farm wedding as a bridesmaid, including finding pictures of the venue to strategize what Kensky would need to navigate stairs or use the bathroom. Downes adds that more than just moving through the event, Orr helped Kensky maintain her femininity. Three years after the blast, Kensky is still on the road to recovery. Since her voluntary amputation, she’s undergone another 10 surgeries, most recently to reattach a segment of muscle in her right leg. And that guidance continues to help her face physical and psychological challenges with confidence and purpose. Kensky and Downes both lose their left legs below the knee in the Boston Marathon bombing. Kensky and Downes become patients at Walter Reed Bethesda, where they meet Orr. With the help of Orr’s charting task — measuring how long it takes to accomplish daily activities, her pain level and her perception of functioning — Kensky decides to amputate her right leg. Orr designs a therapeutic activity to help Kensky say goodbye to her right leg, in which Kensky makes colorful, commemorative footprint artwork. Kensky undergoes voluntary amputation of right leg, which had not healed properly since the terror attack. Kensky testifies in Boston Bombing trial. 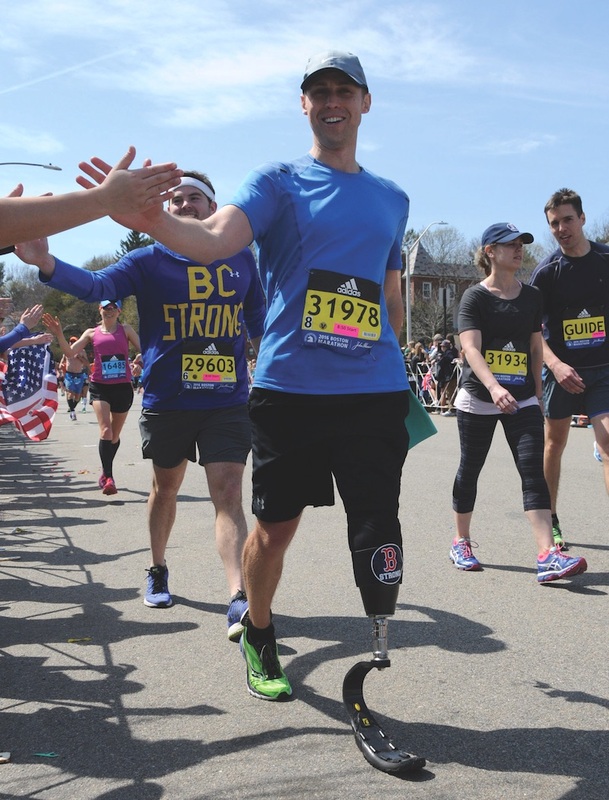 Downes completes the Boston Marathon in just under six hours on a carbon-fiber, blade-shaped prosthesis. Kensky has the 10th surgery after her voluntary amputation, this time to reattach a muscle segment on her right leg. Watch Downes and Kensky deliver the keynote address at the 2016 American Occupational Therapy Association’s annual conference.